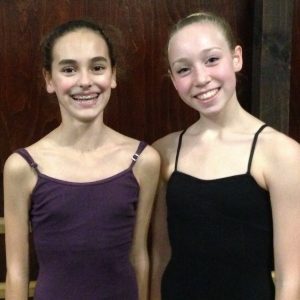 Congratulations to Pre-Professional Academy students Priscilla and Marin who were both accepted into Canada’s National Ballet School for Summer 2016! The summer program is the second-level audition for the full-time Professional Ballet Program. This will be Priscilla’s first summer at NBS. Marin will be attending for her third consecutive summer. She deferred the previous invitation into the Professional Ballet Program to continue training with Mr. Carney at the Academy, and to continue living at home, until she was older. She now aspires to join the full-time program at NBS in September 2016. The Professional Ballet Program Canada’s National Ballet School provides full-time ballet and academic training to students from Grade 6 to 12 as well as a Post-Secondary Program for academic graduates. The ballet training represents the highest standard of professional ballet training, while academics follow Ontario’s Ministry of Education curriculum. Canada’s National Ballet School is the only ballet school in North America to offer ballet training, academics and residence facilities all on one campus. Students graduating from the School receive an Ontario Secondary School Diploma. There are approximately 150 students in the Professional Ballet Program (PBP). Students in the Professional Ballet Program come from across Canada and around the world, and approximately two-thirds of the students live on site at the School’s residence. Canada’s National Ballet School prides itself on the fact that talent is the sole criterion for entry at NBS. Upon acceptance into the Professional Ballet Program all students, regardless of financial means, are subsidized through fundraising efforts. Students ready to represent the Academy at such an audition will receive notice from the office in advance, as it is essential that students are at an appropriate level. As such, students eligible to audition must be pre-approved by Mr. Carney. Students who are not contacted but would like to attend an audition for such a program must first contact the office for approval in order to present themselves as a student of the Academy. Next Post: It’s Nutcracker Time – and tickets are still available!